Here you will find sample device scripts for connecting Intel® Arduino/Genuino 101 and DFRobot LCD Keypad Shield to the TechBubble Technologies IoT JumpWay using the Python MQTT Serial Library. 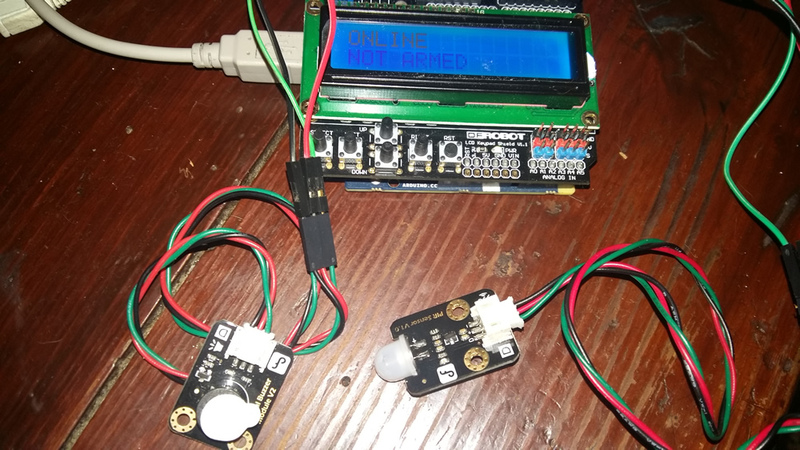 The tutorial will allow you to set up an intruder alarm system that is controlled by the DFRobot LCD Keypad Shield, and communication via the IoT JumpWay. In addition to using the LCD Keypad Shield to arm and disarm the system / turn on and off the alarm, you can also use an application or autonomous device communication via the IoT JumpWay to switch the states of the buttons on the keypad. Once you understand how it works you are free to add as many actuators and sensors to your device and modify your code accordingly. A device application (Arduino) which communicates via serial with a Python Serial/MQTT application. The Python Serial/MQTT application which communicates with the Arduino/Genuio 101 / DFRobot LCD Keypad Shield, and the IoT JumpWay. If this is the first time you have used the TechBubble IoT JumpWay in your IoT projects, you will require a developer account and some basics to be set up before you can start creating your IoT devices. Visit the following link and check out the guides (Roughly 5 minutes) that take you through registration and setting up your Location Space, Zones, Devices and Applications. 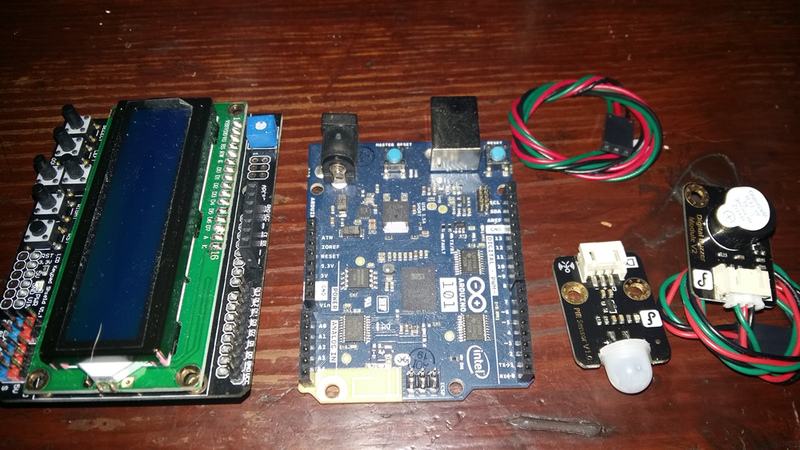 First of all you need to connect up your DFRobot LCD Keypad Shield to your Intel® Arduino/Genuino 101, and connect your DFRobot PIR Sensor Module & DFRobot Buzzer Module. Follow the next steps to accomplish this. Place the shield on top of your Arduino as in the image above. Connect 3 of your male / female jumper wires to on end of your DFRobot PIR sensor wires. Connect the green wire to D2 on the DFRobot LCD Keypad Shield, red to VCC and black to GND. Connect your final male / female jumper wire to the green DFRobot buzzer wire, and the 2 male / male wires to the red and black wires of the buzzer. Connect the green wire to D3 on the DFRobot LCD Keypad Shield, red to VCC and black to GND. Follow the TechBubble Technologies IoT JumpWay Developer Program (BETA) Location Device Doc (About 1 minute) to set up your main device. You will need to select the "LCD Keypad (4 Buttons)", "Motion Sensor" & "Buzzer" actuators/sensors whilst setting up your device in the developer console. If you want to use a second device to trigger autonomous communication, please follow the Intel® Edison Dev Kit LED Python Example tutorial, we will show you how to set up the autonomous communication later in this tutorial. Download the TechBubble IoT JumpWay Python MQTT Serial Library Application and the TechBubble IoT JumpWay Python MQTT Serial Library Config File, you can put them in a folder and name the folder something relevant so that you remember it, you will be able to reuse this application in the future for other tutorials. 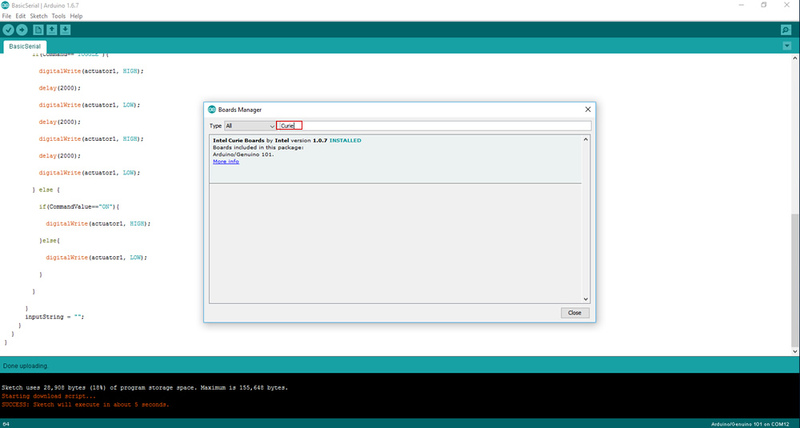 Retrieve your connection credentials by following the link above, and update the config.json file with your new connection credentials. 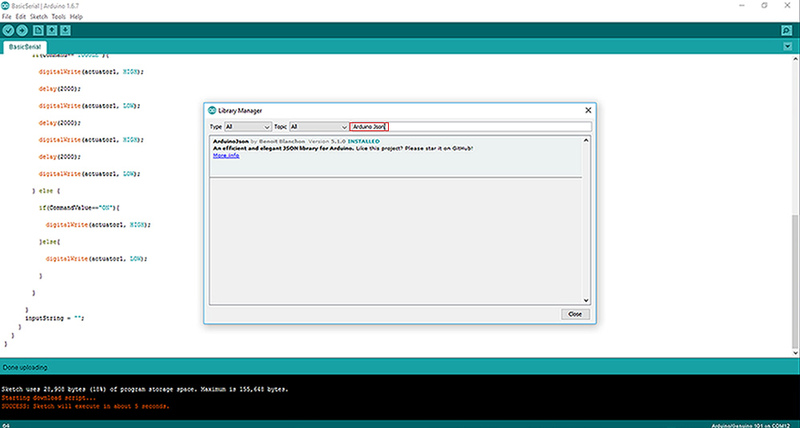 "SystemDeviceCom" : "Your Device Com Port"
"MQTTPassword": "Your Device MQTT PASSWORD"
You may also need to alter the debounceWait variable if the buttons trigger multiple times. Each time you press a button, the device will send sensor data to the TechBubble IoT JumpWay and warning alerts will be sent when the motion sensor picks up data. You can use sensor values and warning messages to trigger autonomous communication with other devices you have connected to the IoT JumpWay. 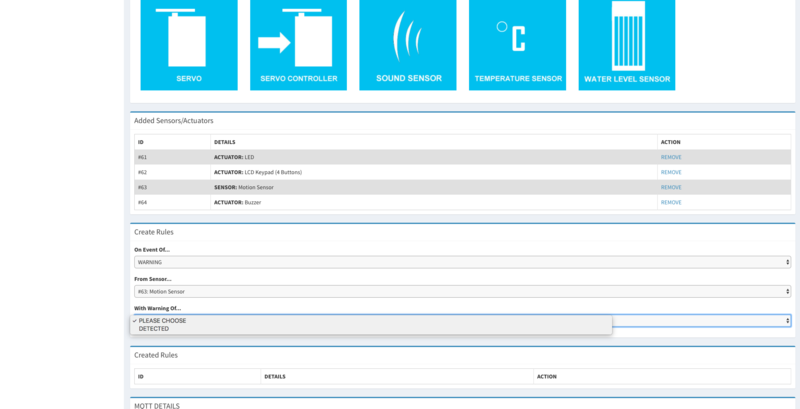 On the device edit page scroll down to the "Create Rules" section under the "Actuators / Sensors". Here you can use the dropdown menu to create rules that allow your device to email you or to autonomously communicate with other devices on its network in the event of status updates, sensor data and warnings. IoT JumpWay Developer Program (BETA) Location Applications give you the ability to plug in control features for all devices connected to your IoT JumpWay Locations into your own applications. In this part of the tutorial we will focus on sending commands from our command application to replicate the buttons being pressed on the DFRobot LCD Keypad. This feature means that you could have an Android/iOS/web application and be anywhere in the world and be able to turn on/off whatever device you connected to the keyboard functions in the steps above. We will be using the IoT JumpWay Intel® Edison Dev Kit LED Example Application and the IoT JumpWay Intel® Edison Dev Kit LED Example Config File, you can put them in a folder and name the folder something relevant so that you remember it, you will be able to reuse this application in the future for other tutorials. "SystemApplicationName" : "Your Application Name"
Start up the application with the following command, if the device and the Serial/MQTT applications are running, you will see the output in the Serial/MQTT application and the buttons 1 -4 will be triggered on the device, in turn, communicating with the device you connected up in the autonomous communication section above. You will be able to access the data in the TechBubble IoT JumpWay Developers Area. Once you have logged into the Developers Area, visit the TechBubble IoT JumpWay Location Devices Page, find your device and then visit the Sensor/Actuator page to view the data sent from your device. Please feel free to create issues for bugs and general issues you come across whilst using the IoT JumpWay Intel® Arduino/Genuino 101 Examples. You may also use the issues area to ask for general help whilst using the IoT JumpWay Intel® Arduino/Genuino 101 Examples in your IoT projects.